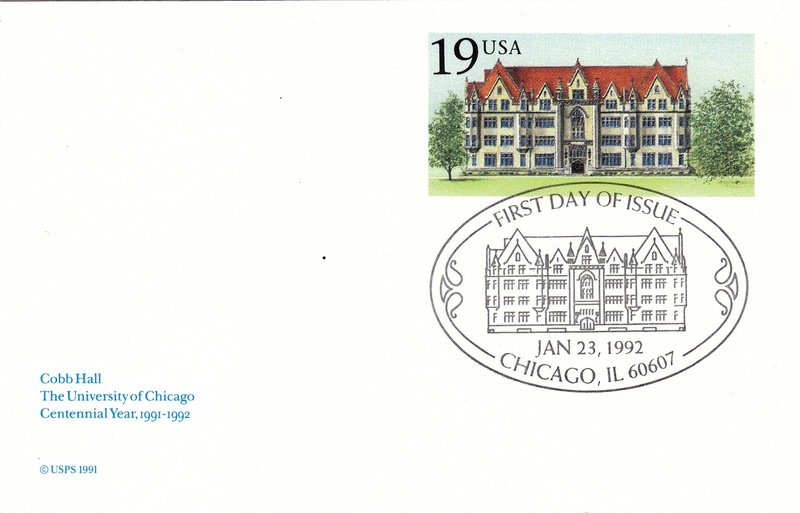 On January 23, 1992, USPS issued a stamped postal card with a 19-cent pre-printed stamp to commemorate the Centennial of the University of Chicago. The card features the first building completed on campus in 1892 - Cobb Hall, named after benefactor Silas Cobb. Designed by Henry Ives Cobb (not related to Silas Cobb), the building was modeled after the Gothic style featured prominently on the Oxford University campus in England. It currently hosts the humanities and social sciences, as well as the Center for the Study of Languages, and the Renaissance Society Contemporary Art Museum. 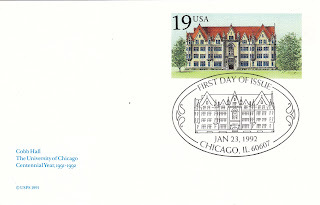 The first-day-of-issue postmark, cancelled from the city of Chicago, IL, also features an outline of Cobb Hall. Update: the card was later sent to Belarus as US-3841631.